So I look at the clock, think "okay, I've got ten minutes 'til I get booted offline", and promptly begin a drawing. I'M A CLEVER ONE. Okay, it's mostly that I haven't drawn anything in a really long time and I was feeling antsy. This is a little tidbit from an idea I want as a full scale painting (watercolor, most likely); a forest of cranes, filled with bird nests, etc, all kind of dull and drab, with a really washed out sky. Dunno where it came from...probably something about deforestation, or something. ...er. And now I away to finish reading Frankenstein. nifty, I was actually thinking about drawing some construction machines recently. something about the pathos of overworked and rusty machines interests me. the contrast of placing a birthing place in the midst of gloomy, decaying structures is pretty cool. 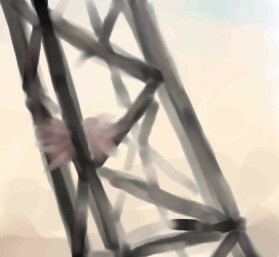 I used to see nests in the bell buoys ..this looks like that to me..
Oh, I love cranes, and watercolor. I'd like to see some "dull and drab"!